We take the security of your data very seriously. If you wish to restrict access to a dashboard, all our plans (Basic, Team, and Company), as well as some previous plans, offer an IP restriction functionality which allows you to whitelist the networks or devices from which your shared dashboard can be accessed. We do not currently support IPv6 addresses. On the dashboard you want to restrict access to, click Settings from the navigation menu. From the drop-down menu, click Dashboard settings. In the Allowed device IP addresses field, input the IP addresses you want to allow. Multiple IP addresses should be separated by a comma. It is possible to enter IP ranges, e.g. 108.171.123.0/24. If you need to add more than one range, simply separate them with a comma, e.g. 108.171.123.0/24, 27.123.64.0/24. A 404 error will be displayed if access to a Sharing Link is attempted outside of an allowed network. 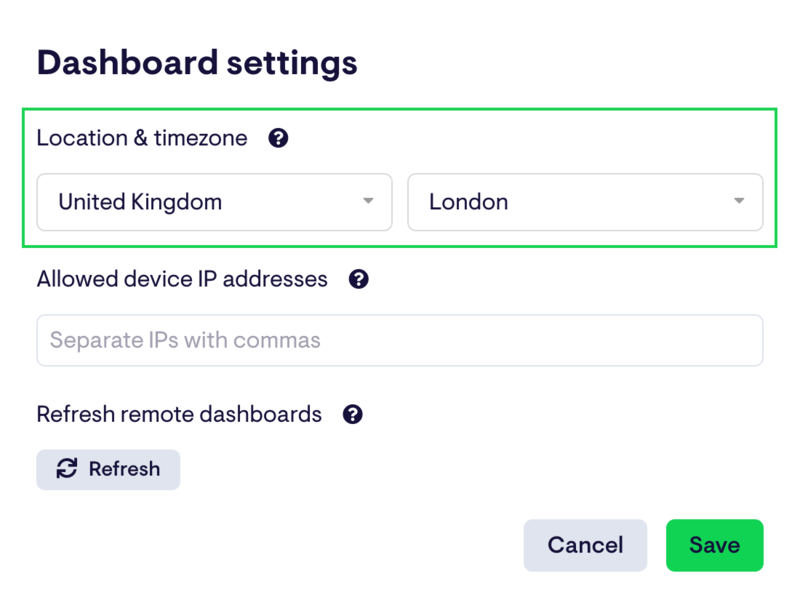 Dashboards with IP restrictions will only appear in Dashboard Loops if the user is viewing the loop from a whitelisted IP. Dashboards will be visible to all users on your account who are account owners, organization admins or have users who have read-only access to the dashboard, including via our iOS app. Widgets will fail to load if a dashboard displayed using Screens is restricted to a different network.